In the Mediterranean, late Fall/early Winter is olive picking time. Truthfully, it’s not met with much enthusiasm. It’s one of the many chores, the labors of love, of living in God’s country. All summer long, knotted olive tree branches weigh heavy with green olives slowly ripening in the relentless summer. Did you know that black olives were nothing more than ripened green olives? That was a total news flash for me. Most families in Cyprus have their own olive trees. And with these olive trees, they provide their own families’ supply of organic olive oil for the year. If you come from a particularly wealthy family, you own an orchard. The olives are collected by teams of seasonal workers; but even then – the entire family still pitches in and helps pick olives on Saturdays and Sundays. 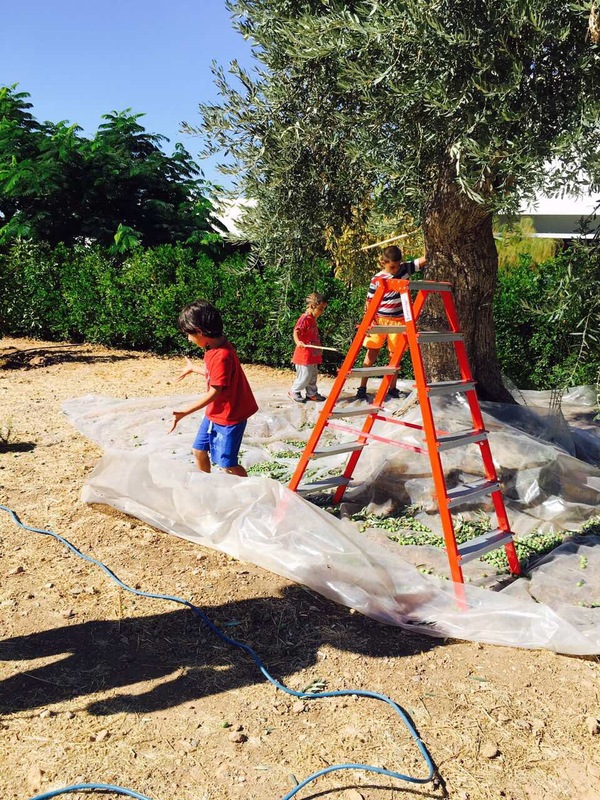 Olive picking is a family affair. As an American, all I knew about olive oil was that it tasted good (especially when I dipped fresh bread into it with salt, pepper and oregano). I could find rows of bottled virgin, extra virgin, cold pressed, and regular olive oil lining my grocer’s shelves. But I had no idea what all these really meant. After living in the Mediterranean for 8 years, and going through 7 harvests, below are some of interesting facts about olives that I thought I’d share. Wear long sleeves, gloves and boots! 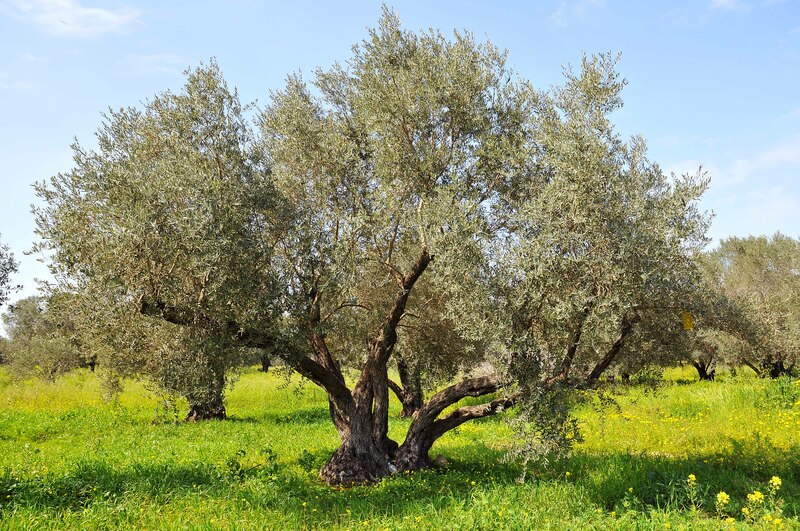 Olive branches are super scrappy and they tear through skin like a sharp razor. Okay – that’s an exaggeration. But they really do hurt! I’ve got one scar on my hands from years ago that still hasn’t healed from an olive brush. As for the boots – olive trees do not need much (if any) watering, so the ground below is quite dry, and often brush-like. They are also a breeding ground for rodents, which totally gross me out. Where boots to protect your pedicure. Process of picking olives hasn’t really evolved much over the years. Spread a big blanket on the ground and then begin to gently hit shake the tree branches. For high up branches, you will need a ladder, a broom stick or both. Be careful when standing below! Dropping olives are like big pebbles landing on your head! Olives are really bitter off the tree! They are pretty much inedible. Trust me, I’ve tried. To get them to table-serving worthy, you need to ferment and cure the olives. The process of curing/fermenting involves adding it to salt-water brine and changing out this brine for about a week. Then letting the salted olives soak for another few weeks, until they get soft, salty, squishy and yummy. BUT to get high quality OLIVE OIL, you should press the olives within 24 – 36 hours of picking. Once pressed, keep the olive oil in dark barrels, hidden from direct sunlight for a month to allow the debris to settle. Then the oil is spectacular. You need about 3 kilos (10 pounds) of olives to yield a liter of olive oil. The skin and pits are the heaviest part of the fruit, and therefore there is a significant amount of waste when pressing. Interestingly, in recent years that debris has been used for all sorts of commercial use: crushed pits are baked into bricks, which are used to build houses. Broken skin is soaked and used into making soaps and cosmetics. Like anything, when you work for your food, it tastes all the sweeter. But I got to admit: I’m glad it’s only once a year. Life is Food and Food is Life.